March for Marrow Los Angeles is an inspiring and festive 5K run and 1- and 2-mile walk created by patients with bone marrow failure diseases, their families, friends and supporters to inform the public about these rare diseases, their symptoms and signs and the resources and facilities for diagnosis, treatment and protocols available in the greater Southern California area as well as nationwide. As our celebrity promoter, Mia Hamm of the US Women’s National Team says, “This run is perfect for the new and seasoned runner. The course is scenic, flat and fast. When I can, I run it in memory of my brother.” We’ll run south along the beautiful Long Beach Shoreline and back. Running prizes will be provided by Brooks Running Shoes, Runner’s High and NIKE. In addition, there will be awards for the top three running categories for each age group and participant medals for everyone. Everyone gets a Goody Bag. Be the Match will be there to recruit new potential donors to the National Marrow Donor Program. March for Marrow also includes an exciting Silent Auction and Poker Walk Game as well as a Moment of Remembrance and art project for the kids. Come RUN, WALK, MARCH with us to find better treatments and a CURE for bone marrow failure diseases. 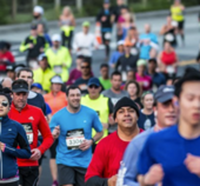 Saturday, April 27, 2019, 6:30 am for 5K Registration; 8:00 am 5K Start, at Shoreline Village, 429 Shoreline Village Drive, next to Parker’s Lighthouse. Up to 2 hours - $1 with validation with a minimum purchase from Shoreline Village merchants. Parking structures are available for $5.